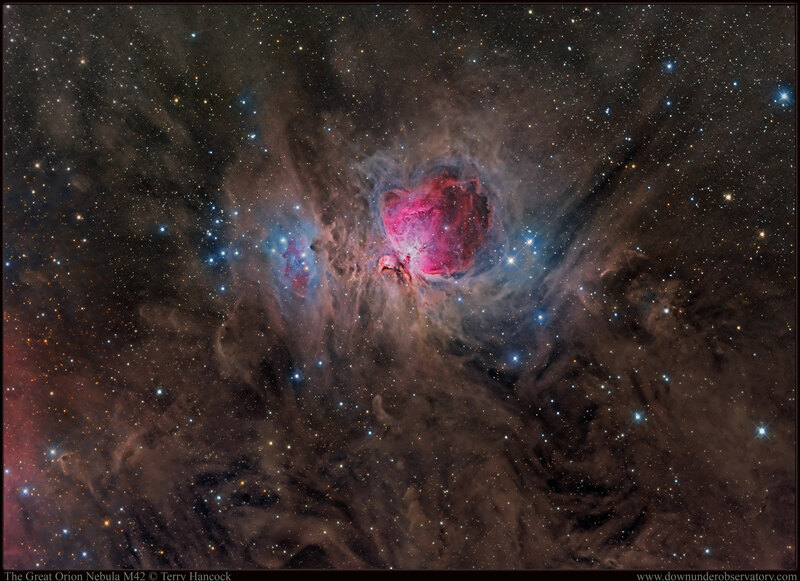 Explanation: The Great Nebula in Orion, also known as M42, is one of the most famous nebulas in the sky. The star forming region's glowing gas clouds and hot young stars are on the right in this sharp and colorful image that includes the bluish reflection nebulae NGC 1977 and friends on the left. Located at the edge of an otherwise invisible giant molecular cloud complex, these eye-catching nebulas represent only a small fraction of this galactic neighborhood's wealth of interstellar material. Within the well-studied stellar nursery, astronomers have also identified what appear to be numerous infant planetary systems. The gorgeous skyscape spans nearly two degrees or about 45 light-years at the Orion Nebula's estimated distance of 1,500 light-years.